Scuba diving has always been a big attraction along the Great Barrier Reef but in recent years it has become simply enormous. It is some of the most spectacular in the world with rich marine life, stunning coral formations, comfortable year round water temperatures and amazing visibility. Whether you are a beginner or expert diver Australia's Great Barrier Reef should be at the top of your list. 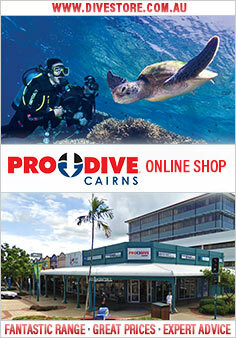 There are many diving schools in Cairns that have dive shops and offer diver training. The main consideration with scuba diving is that it requires knowledge and care. You can sling a mask on and be a snorkeller in minutes - add an air tank on your back and diving becomes a whole new experience. More advanced diving courses last a week or more and include classroom instruction and underwater experience in a pool, followed by real dives in the sea. A good diving course should teach you to anticipate possible problems and avoid them. Some things will become second nature to you underwater - always keep breathing, don't hold your breath, adjust your buoyancy - and become straightforward techniques. At the end of the course you will receive a scuba diving certificate. Once you have a recognised certificate, the world is your oyster and you will be welcomed by Dive Operators all over the world. 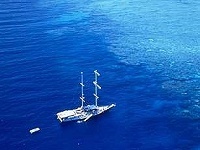 In Cairns, there are day trips and extended live aboards that suit all levels of divers. Dive operators either rent out all diving gear or include it in the price, however most divers prefer to have at least some of their own equipment. The usual minimum is mask, snorkel, fins and boots. These are items for which most divers have personal preferences and good product can be purchased at any of the dive shops. The safety of the North Queensland diving industry is amongst the best in the world through a balanced mix of professionalism amongst dive operators, and industry guidelines and regulations designed to maximise the safety of all divers. Regulations and requirements are somewhat different here compared to other countries, and one that you will come across regularly is the concept of the Dive Medical. Please take some time to read about them. If completing 1 dive in one day, wait at least 12 hours before flying. If completing 2 dive in one day, wait at least 18 hours before flying. If completing 3 or more dives over a few days, wait at least 24 hours before flying.